Wash hands. Wash all fresh, unpackaged produce under running water. Drain well. Sauté mushrooms in butter for 2 –3 minutes, set aside to cool. In a large mixing bowl, beat together mayonnaise, cream cheese, garlic, and hot pepper sauce until combined and smooth (1–2 minutes). By hand, stir in sautéed mushrooms, 18 oz. of cheddar cheese, and artichoke hearts. Refrigerate until needed. CCP: Cold food held for later service must maintain a maximum internal temperature of 41°F. 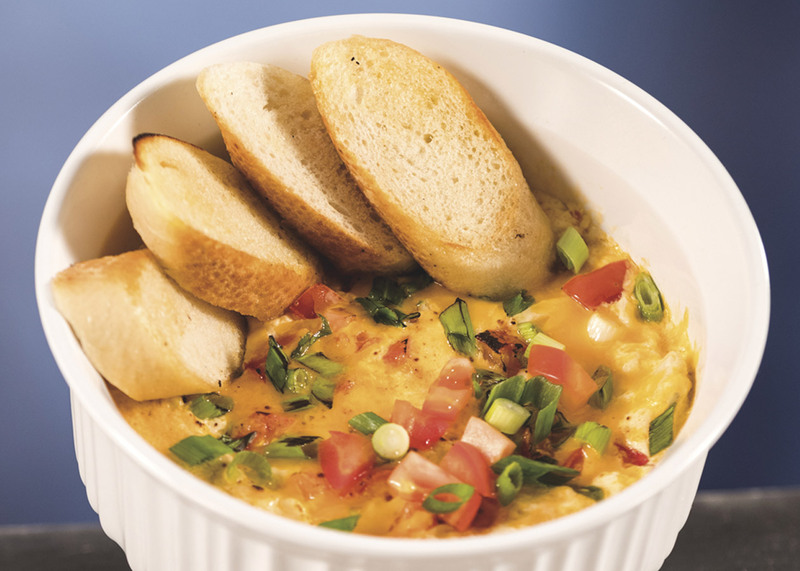 Top with ½ oz (15 g) each of diced tomatoes, green onion, and cheddar cheese. Bake at 400°F until cheese is melted and nicely browned. Serve with sliced French baguette.